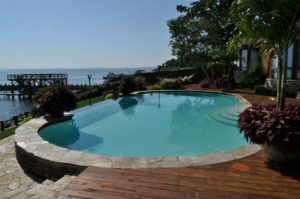 Sunset Pools leads the industry in construction and pool expertise. Our team of professionals communicate from project conception to completion, creating the best product for your value. Sunset Group is moving toward eco-friendly technology. This trend includes the development of energy efficient pumps, filters and lighting. When it comes to pool maintenance and service, Sunset Group is second to none. We offer many maintenance packages depending on your needs. Sunset provides spring openings and winter closings. Our team of technicians can provide you with pool services that include weekly, bi-weekly, and monthly programs that fits your continuing pool needs.